Time is my biggest adversary. Not only because I am getting older (as my mirror continues to remind me of, lol) but because I am SO, SO, SO behind on my scrapbooking! I want to get a lot more scrapping done, but it is a time-consuming craft. I have some tips on how to get more scrapbooking done when you are short on time. These ideas should help you crank out more pages then ever before! If you don’t actually scrapbook then you won’t actually get any pages done! That is just a FACT! You have to sit down and do it. If you are like me then you have to SCHEDULE some crafting time. There is ALWAYS something else you can be doing. You have to make time for your hobbies and you won’t regret it. I like to do most of my scrapbooking during weekend crops. More pages will be created if I am not at home. I try to schedule 3 or 4 weekend crops per year and I usually complete 40 to 50 layouts during these weekends. If you have set aside time to scrapbook, but you keep getting up to change out the laundry you won’t be as productive. It takes me a while to get into the “groove” when I scrapbook and if I am constantly having to stop and get someone a cup of milk it isn’t going to go well! Try to set aside some time when you can limit distractions. When we FOCUS on our craft we become AMAZING and get more done. You may need to wait till the kids go to bed or to grandma’s house and then get to work! Most women I know have a calendar/planner so they can keep track of their family’s schedule. Did you ever think that you needed an organizer for your crafting? Well, I am here to tell you that you DO! I created a Scrapbooking Organizer specifically because I had the need in my own life. We all know that if one person has the need….many more do too! I am able to keep track of what I have accomplished and what still needs to be done. I don’t have to sort through albums to see where I left off. All of my information is right in my organizer and I can print off an unlimited number of pages!! Not every layout has to be your absolute favorite. When I want to get more done I try to focus on my pictures and not get as fancy with my layouts. 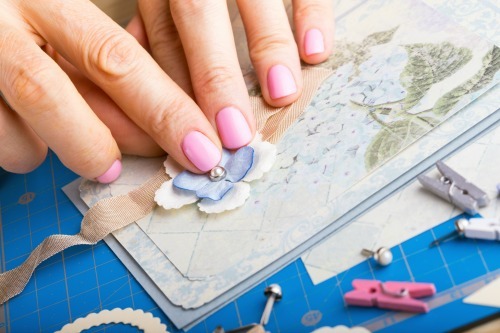 Think back to when you first started scrapbooking. Chances are you didn’t use 20 different embellishments on one layout. It was a more basic craft and it grew over the years. When I do simpler layouts I will get more done. One way to get more layouts done is to do pocket scrapbooking or Project Life. I know the original concept of Project Life was doing one per day. Personally, I don’t do that, but I do love the products and find it is easy for me to record memories in record time! There are some fun Project Life Pocket Scrapbooking monthly kits too! I also love to use the pocket scrapbooking to supplement holidays and big events that have a TON of photos! Disorganization can KILL my creativity and really limit how many layouts I get done. Don’t get me wrong…my craft room is FAR from organized. It is a work in progress! I do know that if I can grab the embellishments I need quickly I will get the layout done sooner. The key is knowing where your supplies are located even if your organizational style doesn’t appear to be very good, LOL! A lot of time can be wasted searching for something you know you have. If I want to get a lot of layouts done quickly it helps if I focus on one theme. I may decide to do Christmas 2015 and so I can get out all of my Christmas paper, stickers, washi tape, etc. Getting in the Christmas grove with my layouts helps me work faster. I have everything at my finger tips and it speeds up the whole process. If I am at a weekend crop I may not want to do Christmas layouts for 3 days. I will usually do one whole day of Christmas and then switch to a different theme for the next day. That helps me not get burned out, but still be able to focus for an extended period of time! How Do You Get More Scrapbooking Done When You are Short on Time? What is your favorite tip to getting more scrapbooking done? I am ALWAYS up for a new way to create more pages. 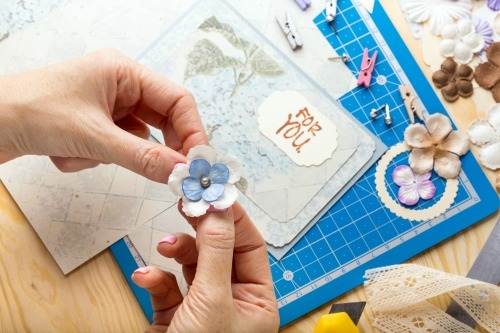 Are you in my Sweet Scrapbooking Facebook group?? You should be…there are great ideas shared every day…plus some good humor. Don't forget to grab the free photo organizer below!! Thanx for these lovely ideas of doing scrap booking in minimum time. As I have bookmark this page and will sure follow the tips given by you.